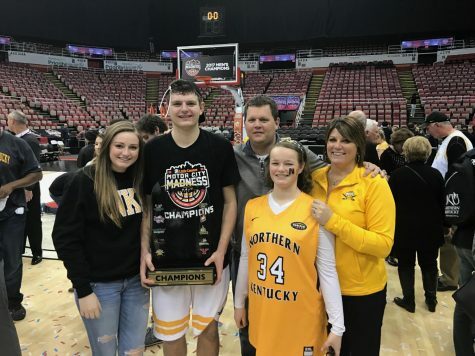 During most NKU men’s basketball games, Christie McDonald sits in the stands as if she is a coach; her expression is stern, not wanting her son, Drew, to be able to read what she is thinking during a game. After the game is a different story, according to Drew. During NKU’s homecoming game, however, a nervous feeling filled Christie as Drew and the Norse tried to hold off Green Bay in the second half. As a member of the NKU women’s basketball team from 1987-1991, Christie McDonald collected 1,339 points–the 11th-best in the team’s history–and grabbed 850 rebounds (which ranks her as fifth-best). After she graduated, Christie became the women’s basketball coach at Newport Central Catholic High School. 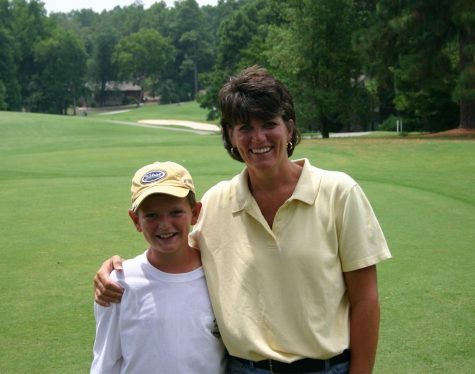 Her son, Drew McDonald, was always around and served as a ball boy for the team. Being around the team, Drew picked up on the nuances of the game around the time he was in the second and third grade. Christie has the ruined dry erase boards to prove it. The plays Drew made up on the white board made appearances in NCC women’s basketball games. He was able to recognize how to get Christie’s players in the best situations to succeed on the floor. “He just has a knack for understanding the game,” Christie said. This understanding of the game has vaulted Drew into the record books, joining his mother as a member of the 1,000-point club at NKU. Drew reached the milestone just eight games into his junior season against Morehead State and is the 26th player in NKU men’s basketball to reach 1,000 career points. Christie was in the arena that night and after he scored the basket that lifted him over the milestone, Drew looked up in the stand at his mother, who cried in her seat. “When you see all the work and all the years… it’s the Sunday night’s getting up at 7:30 for AAU practice. It’s shoveling the snow off the patio in the backyard so he could go out and shoot when it’s cold,” Christie said. While Christie doesn’t know her exact point total from her time as a Norse, her husband Jeff, a former NKU tennis player, does. While Drew beat his mother in points scored at NKU, Christie has the advantage in high school rebounds collected. She accumulated more than 1,000 rebounds in high school while Drew fell just 14 short of 1,000. “It’s tough for all those times you just didn’t give that last burst and could have had one,” Christie said to her son. With so many athletes in the family, the competitive spirit in the house is high. The McDonalds compete at every aspect of life, whether it’s seeing who can run to the car, get their seatbelt on and shut the door first or who can find the most variety of license plates or guess the next mile marker on a road trip. Christie says Drew and Jeff are the most competitive of the bunch–they developed a points system to see who picked the best NASCAR driver in any given race. As Drew got older, this extended to professional golfers. It doesn’t stop with the immediate family though: Christie’s father played basketball at Xavier University, two of Drew’s aunts and one cousin played collegiate volleyball and his uncle played basketball at Thomas More. Christie would play against Drew in Jeopardy when he was younger, but that stopped in the fifth grade when her son started knowing most of the answers. His grandfather still records the show so they can all watch it together. This can result in high-tension situations when the family decides to play a board game during the holidays, including an infamous game of Thanksgiving Pictionary where Drew’s sister attempted to use a drawing from a previous round in an All-Play, an illegal move. The family is emotionally invested in NKU basketball, said Christie. They have four rows of season tickets in BB&T Arena right behind the NKU bench; after homecoming they were deciding who would reserve rooms for the Horizon League tournament. The family has become so invested in the team that senior guard Lavone Holland II has been welcomed into the McDonald family, and ate Thanksgiving dinner as well as spent some of Christmas Day at their house.